I've written previously about a couple of other insulated greenhouses, so I thought I'd focus here on what makes Oehler's design different. The most obviously unique feature of Oehler's greenhouse is the cold sink --- a lower aisle near the front. The original purpose of the cold sink was to give Oehler head space on the downhill side of the greenhouse without requiring so much excavation on the uphill side. But, as the name suggests, this lower aisle also allows cold air to pool away from the plants. 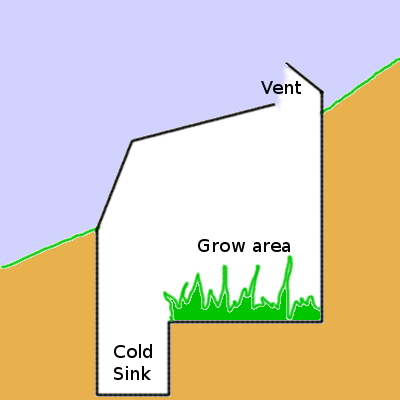 The cold sink is pushed up against the south wall, an area that is usually in shadow during the winter and is thus of little use for growing plants. Using the earth as insulation and thermal mass is another difference between Oehler's greenhouse and many others you'll see. He recommends using either water tanks or masonry to turn the north wall into a heat battery, soaking up the sun's rays during the day and radiating the warmth back out into the greenhouse at night. Insulating behind the upper three feet of the wall keeps out cold air from above, but Oehler feels you should leave the rest of the north wall uninsulated to let the soil continue the heat-battery concept. Similarly, he feels that you'll actually get more warmth in the greenhouse over the long run if you sink the east and west walls into the ground rather than covering them with windows. Another design factor Oehler brought up is the angle of the glazing. (More on the glazing material in a later post.) Oehler has found that you get the best light penetration if the sun is perpendicular to the glazing surface, meaning that you'll need to plan for which time(s) of year you want the most light. 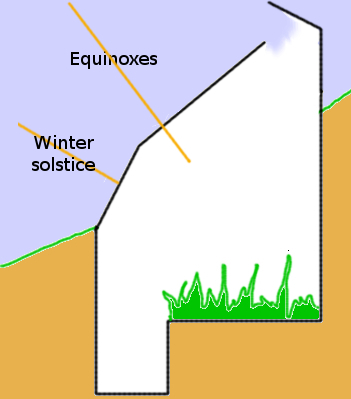 One option is to raise the south wall out of the earth at an angle, perhaps matching that to the sun's angle at the winter solstice (around 30 degrees here), then matching the roof glazing to the sun angle at the equinoxes (around 53 degrees here). Alternatively, you might choose different angles if you're mostly using the greenhouse during the spring, summer, and fall and want full light penetration during those times rather than during the dead of winter. Finally, Oehler recommends that we learn from his mistakes and provide much more ventilation than he originally planned for. 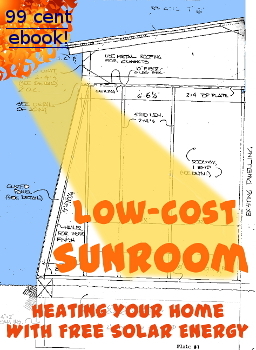 He's found that plywood at the peak of the roof doesn't shade the interior at all except at the summer solstice (a time when you're likely to have the vents open), and that wood makes vent-construction easier. With 20/20 hindsight, Oehler recommends covering the entire peak of the greenhouse with these vents, and also including cold-air intake vents somewhere lower down (like at the bottom of the door). Trailersteading will inspire you to go back to the land on the cheap. I am looking forward to your thoughts on glazing. Looking at the drawings it looks like it might be beneficial to put a hinge at the base of the glazing on the south and change the attitude with the seasons. At every air/glass interface you lose around 4% of the light through reflection even if the sunlight falls perpendicular to the glass. So that's 8% for a single pane of glass. In this situation the "angle of incidence" is 0°. As soon as the angle of incidence becomes larger, more light is reflected. But as long as the angle of incidence stays below 30°, it's not that much. Above that angle, reflection losses start to climb rapidly. I love the idea of a geothermal greenhouse of that type, but our water table is so high here that they cultivate too much mold. The cold sink during much of the year would be a pool. We've had to abandon this as an option for us here in Indiana.